​The Voice of Indian Cricket. Author, Commentator, Motivational Speaker. ​Harsha Bhogle can talk about the business side of cricket, the technicalities of play and the psychology of the players with equal authority. ​The Voice of Indian Cricket, India's Best Known cricket commentator and journalist. ​IIM-A alum and former Rediffusion ad man Harsha Bhogle has been called “the voice of Indian cricket” -- he's India's premier cricket commentator and columnist. Beloved for his insightful patter, he writes a weekly cricket column for Indian Express and interviews top cricketers on ESPNStar's Harsha UnPlugged. A review in the Indian Express called Harsha Bhogle the voice of Indian cricket and that is a description that has stuck. He gave up a career in management to devote himself fully to cricket and has achieved a fairly regular international presence as a writer and on both radio (with the ABC and BBC among others) and television. He has been the front man for the telecast of live cricket into India on ESPN and Star Sports for several years now and also writes extensively on the game. ​He's been the front man for ESPNStar cricket telecasts from the day they launched in India. Now he has taken to the corporate lecture circuit with his wife and business partner, Anita, applying the wisdom of the game to help companies develop compelling business strategies. ​The Winning Way , a lecture series from Harsha & Anita Bhogle shows how learnings from the field of sport are universally relevant and how they can be applied to improve our approach to life.. In this series, two IIMA alumni , the husband and wife team of Harsha and Anita Bhogle discuss how champions and champion teams handle issues like team building, leadership, vision and goal-setting. What do winning teams do, what makes winning teams, who are good leaders, why do only some teams keep winning while others win only for a while and then lose…these are some of the topics that this popular corporate lecture series addresses. A management background combined with a ringside view of sport over the last 20 years is what goes into these sessions. The Winning Way allows managers, otherwise caught up in day to day work life, to sit back, introspect and rediscover their passion for excellence through the medium of sport . The presentations that Anita creates are brought alive by “the voice of Indian cricket” Harsha Bhogle. 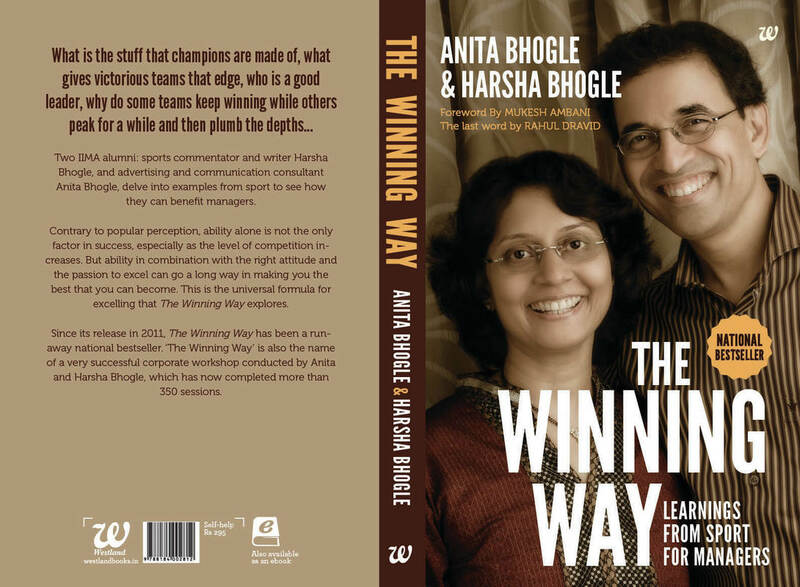 After conducting over 300 corporate workshops, Harsha and Anita co-authored “The Winning Way –Learnings from sport for managers”, a national best seller. The book, translated into 3 languages is also popular in its Kindle and audio book versions.